Hello and welcome to the 188th instalment of the SWD. The Syrian Democratic Forces have made strategic advances in the south-west front despite the ISIS landmines. Moreover, SDF managed to kill six ISIS terrorists following clashes in Muroor district. Additionally, five ISIS militants were killed in Al Nahda neighbourhood. SDF advanced 100 meters on Qusad Al-Mu’taz street, which is located west of al-Mansour district, SDF sources announced that ISIS corpses litter the street. The US-backed forces pushed from two axis to surround the al-Atiq mosque, its liberation is imminent. Three civilians were wounded after Turkish-backed FSA shelled the city of Tell Rifat. Several government soldiers were killed after HTS shelled their positions in BAshkoy village in northern Aleppo. Hay’at Tahrir Al-Sham continues arresting media activists. Today Ali al Mar’ei has been detained near the village of Harzareen. The SAA unit “ISIS Hunters” have captured Huwaysas. 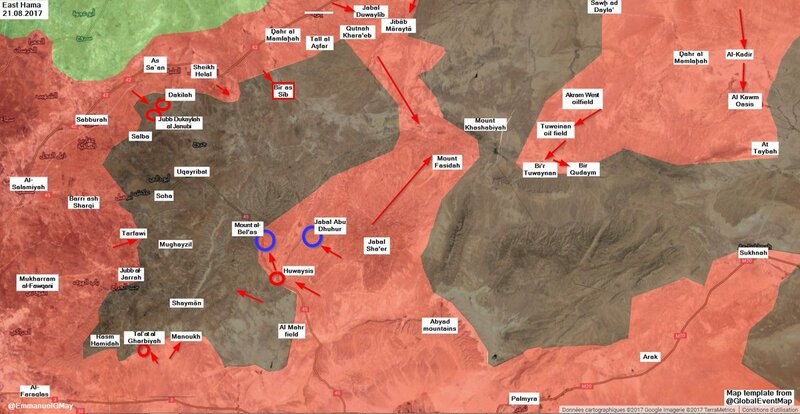 Government forces expect to capture all the Uqayribat pocket in approximately two to three months. The pinch movement made by SAA’s elite unit Tiger Forces through al Qawm and Al Teybah continued to make advances in two opposite directions. On the on hand, Tiger Forces pushed south of Al Teybah and captured Al Quwayr, Al Latum and Dahr al Maitn. On the other hand, Tiger forces also pushed to the locations on the southwestern part of the Akram oilfield. Tiger Forces are now four to five kilometers far from Sukhnah forces, which would create a second ISIS-held pocket in central Syria. Capturing th3 gas and oil fields could the Syrian government economy an important boost. Since oil and gas can be used inside the country for energy production and improve living conditions of the population that have suffered almost 7 years of conflict. It also can be exported, but this option remains unclear since few countries would like to buy gas and oil from a sanctioned country. Reports suggest that Tuweinan gas plant is in good conditions. Contrarily to what ISIS has done to those gas and oil plants they left behind when retreating, which implied sabotage and blowing up the whole infrastructure. In fact, the plant was the center of alleged deals between IS, the Syrian government, and Russia, even when under IS control. By capturing Tuweian gas plant, the government now can produce an extra 600.000 cubic meters of gas a day, increasing the total Syrian government gas production from 11.5 million cubic meters to 12 million cubic meters a day. It is estimated also, that in 5 months, the plant will be producing 1.1 million cubic meters a day. 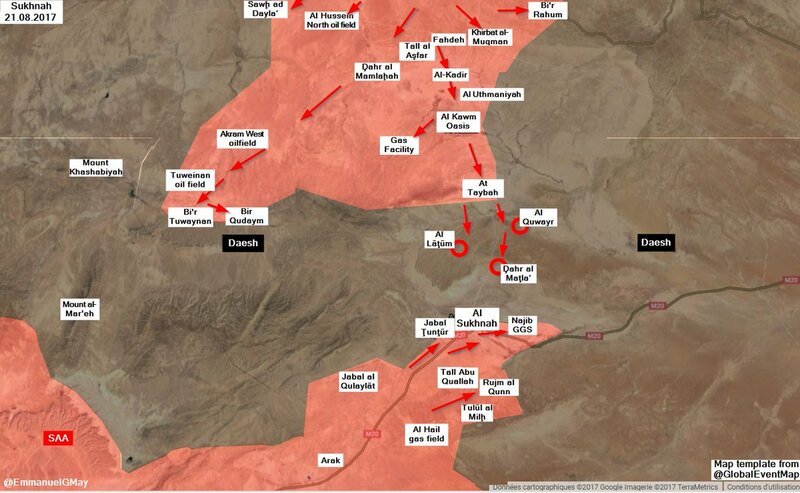 The Syrian Arab Army and Hezbollah units took control of a strategic hill and other positions that include Qurnat ‘Ajlun, Shu’bat ad Dawwab and Qurnat Shu’bat Akku from ISIS forces the operation in Qalamoun mountains continues. The FSA group handed over Abu Muhammad Al-Jordani to government authorities as a gesture of good faith. On the 20th of August 2017, CJTF-OIR has conducted 26 strikes in Syria. CJTF-OIR‘s main focus in Syria is Raqqa region where they did 21 strikes supporting SDF‘s operations against IS destroying 22 fighting positions, two UAS staging areas, two heavy machine guns, a vehicle and an explosives cache. Other areas where five strikes occurred are Abu Kamal, Al Shadaddi, and Deir ez-Zor destroying nine ISIS oil stills, eight ISIS well-heads, three oil barrels, two command and control nodes and a fighting position. The full report on CJTF-OIR strikes conducted in both Syria & Iraq can be found here.